A few years back I composed a post about schools and their Mission, Vision, and Learning Principles. I was reminded of this post last week as we enter a new academic year. At my current school, we begin each academic year by including time for faculty and staff to engage with our school’s Guiding Statements; Mission, Vision, and Values. This year we modified a Visible Thinking Routine to help guide us; Claim Support Question. Each small group, composed of faculty and staff members, was given a Guiding Statement to focus on. First, each group needed to make a claim about the Guiding Statement, explain or interpret it in their own words. After that, members of the group brainstormed all the ways the school already supports this Guiding Statement; what do they see, hear and feel in the school. As the small groups consisted of both new and returning teachers, this was a great way to hear different perspectives on our school’s identity. Finally, we posed a question to the group, which was they way in which we modified this Visible Thinking Routine. The question posed was, “How will we continue to deepen implementation of this Guiding Statement in our school? This allowed our staff and faculty to push their thinking further and focus on the new academic year ahead of us. Just having a Vision, Mission, and any other Guiding Statements at your school is not enough. How are these actually guiding your school’s growth and development? How are they living in your school and not just acting as wallpaper? How do you collect evidence of their effectiveness throughout the year? As many of us are heading back for a new academic year, what are some of the ways your schools come together to have a shared understanding of who you are as a school, where you want to go, and what you value as a school? 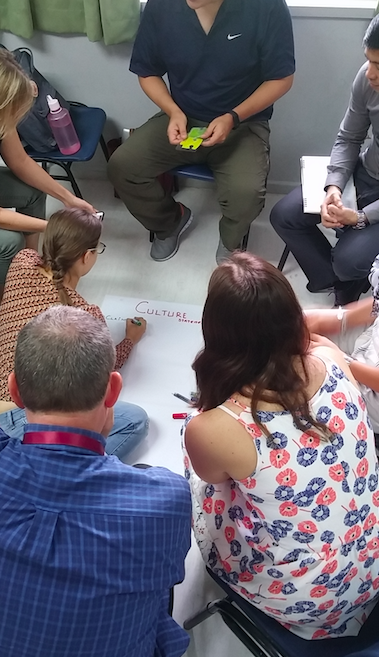 This entry was posted in culture, international teaching, leadership, mission, vision and tagged Guiding Statements, mission, values, Visible Thinking Routine, vision. Bookmark the permalink. for international students, i got some amazing tool to help with learning 3000 the most important words in English!